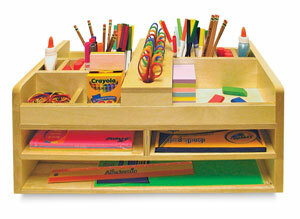 This handy teacher's craft organizer combines functionality and portability. The top of the 9"H × 22"W × 12"D unit features 8 scissor holes, as well as multiple compartments for holding small items like pencils, crayons, markers, and glue. Tucked in the side are two small shelves for storing 8½" × 11" paper and a large bottom shelf for oversized paper or books. It also includes convenient hand-holds on either end for ease of transport. 15 lb.